Short-term, high-interest payday loans are illegal in several states, but that doesn’t stop consumers from trying to get their hands on quick cash. So when they see a website offering to hook them up with a payday lender and get them up to $1,000 in about an hour, it may seem like a good deal. That is, until that loan never shows up and the borrower has even less money in her bank account. Late last week, the Federal Trade Commission got a U.S. District Court in Illinois to halt the operation [PDF] of a network of at least seven websites advertising a service promising to help consumers obtain payday loans. The websites claimed to connected to a network of 120 different payday lenders and touted to visitors that the borrowed money would be electronically deposited into customers’ bank accounts in as little as one hour. They also boasted that, without any sort of credit check being done, “4 out of 5 applicants is approved on the spot,” and that they could get up to $1,000 in their bank accounts almost immediately. To apply for a loan, the borrower needed to provide sensitive personal and financial information, including his Social Security and bank account numbers. Such requirements are standard for online loan applications, but the problem is, says the FTC in its complaint [PDF], that the website operators didn’t use this data to hook borrowers up with payday lenders. Instead, they used it to help themselves to help themselves to unauthorized withdrawals of at least $30. When consumers would notice the missing money, they would try to contact the number listed on the demand drafts used to debit the money. However, in most cases no one ever answered the phone at these numbers. Callers were often told that the $30 was a “processing fee” for the loan application. When consumers replied that they were never told of a fee and that the debits were not authorized, the rep on the phone would insist that the debits were authorized and that there would be no refund. Some callers were promised a $100 gasoline voucher in lieu of a refund, but the FTC alleges that these vouchers were never sent. In a few cases, the company actually agreed to a refund, but in most cases it never materialized. According to the FTC, there is mention in the websites’ Terms & Conditions of a one-time $30 fee to enroll in an “optional” funding assistance program. However, applicants are not required to even go through the process of clicking a button to agree to these terms; they are merely available on a separate page on the website. Some of the websites also used a pop-up window late in the application process — after all the relevant sensitive information had been given — that mentions a $30 fee. 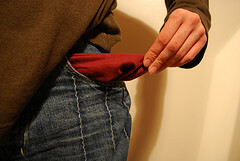 The FTC says that even applicants who halted the process at this point still had $30 fees debited from their accounts. It’s believed that the defendants took in more than $5 million with this scam, using the money to buy fun toys like a 2012 Maserati GranTurismo, a 2011 Rolls Royce Ghost and a 2006 Ferrari 430. However, the court order not only shut down the scammy websites but also froze defendants’ assets. The agency has put together this guide to being sensible about applying for a payday loan online, which also suggests alternatives to payday loans that might not cost you anywhere near as much in fees and interest.